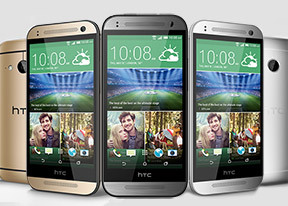 HTC has expanded the One family with a new petite member - the HTC One mini 2. Note that it's not One (M8) mini, this is more of a sequel to the One mini from last year. Perhaps most telling of this is the camera, a 13MP shooter rather than the questionable dual-camera of the M8. Still, the HTC One mini 2 looks just the same as the new HTC One M8, so the family relation is more than obvious. The HTC One mini 2 preserves the qualities that made the original mini great, namely the premium aluminum unibody design, the excellent screen and the stereo front-facing speakers. There are major changes though, the screen grew to 4.5" from 4.3" and the camera more than tripled its resolution to a 13MP. Here's a cheat sheet of One mini 2's specifications. The HTC One mini 2 runs the latest software from Google and HTC on a different Snapdragon 400 chipset than the original One mini. It adds a microSD card slot, which is more than welcome, as the limited storage was one of the more common complaints we've heard about its predecessor. The One mini 2 grew in size as well as features. The original HTC One mini was already taller than most other 4.3" phones, and the new one is even taller. The width of the two though is almost the same. The in-hand feel is as premium as ever, but flip to the next page for our thoughts on the second generation One mini hardware. You too are working at HTC!!!! The phone is BIG DOWNGRADE from the original , the price is higher only the cam and screen are on time!